In a typical world scenario, we come across Internet Service Providers (ISPs) advertising about “high speed internet”. But when we look at our own internet connections, the download speeds seems to be far below compared to what has been advertised. So what did your ISP actually mean by “Connection Speed”? Is “Connection Speed” totally different from “Download Speed”? 3.2 Why different units are used for measuring connection and download speed? People often confuse connection speed with downloading speed. Though both of these terms refer fairly to the same thing, their interpretation is slightly different from one another. Connection speed (or Internet Bandwidth) refers to the raw data transfer rate of the connection provided by your ISP. This is the property that is usually advertised and can vary largely among different providers and data plans. Nowadays, this figure is usually expressed in terms of Kbps (Kilobit per Second) or Mbps (Megabit per Second). On the other hand, when we download files from the internet, the same data transfer rate is interpreted as Download Speed. Download speed is usually measured in KBps (Kilobyte per second). Say you have a 1 Mbps Internet connection. With such a connection speed, you might expect to download files at a rate of around 1 MB per second, but when you actually download a file, the download speed only reaches up to 100 – 120 KB per second. Where’s the catch? If connection speed and download speed are fairly one and the same, as we mentioned earlier, then we should be ideally getting the same speed for connection and download. So what’s missing here? Unit used for Download Speed: KBps (Kilobyte per Second), MBps (Megabyte per Second) and so on. Why different units are used for measuring connection and download speed? A Bit is the most fundamental unit of representing data. That is why it was adopted as a standard for measuring the raw data transfer rate, which refers to the connection speed. Hence, connection speeds are measured in Megabit per second (Mbps). But a bit in itself is quite meaningless. The data in your computer is stored in the form of 8 bit blocks, known as a byte. So when you download any file from the internet, it is generally represented in Byte. Hence, download speed is usually measured in Kilobyte per second (KBps). The noteworthy point here is the difference between bit and byte as used in the two units. Connection speed is represented with a (small) ‘b’ for bit while download speed takes a (capital) ‘B’ for Byte. Let us have a deeper look at the two units. 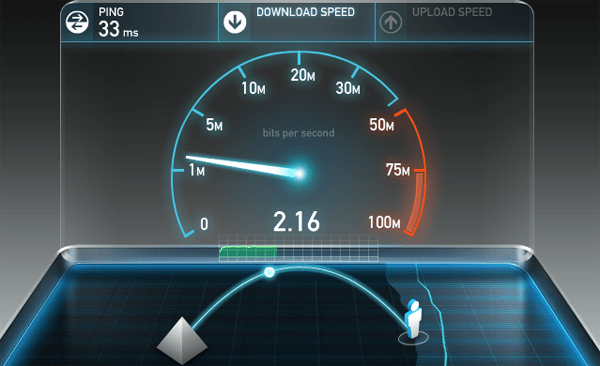 So, in a 1 Mbps connection, your maximum download speed would be 128 KBps (=1Mbps). And this convention kind of suits the ISPs too, as it helps them to lure consumers into visually greater figures. So, we should get a maximum download speed of 128 KBps on a 1 Mbps connection. But practically, we would only be able to download files at 80 KBps – 120 KBps on average. The fall in the download rate can be attributed to several external and internal factors. Packet delivery method: The data that you download from the internet are received by your device in the form of packets. Each of these packets contain additional information, like sender and receiver address, etc. These information, referred to as message headers, make up a considerable part of the data that is downloaded; but is discarded once it reaches the client. The size of each packet and the size of the header information it contains, varies among different hosts. Server capacity: File downloading speed also depends on the host’s network speed. The server you are downloading from should be able to serve the file at a greater speed than your own connection speed. Otherwise, your download speed will be limited to the maximum speed at which the server can serve. Routing: A download request can reach the destination server in multiple ways. Generally, the shortest possible route is selected. But the maximum available download bandwidth will be fairly dependent on the distance between the server’s location and the client’s location. If you are downloading from a server near you, more bandwidth will be available for downloading. But if the server is far from your location, available bandwidth would be reduced as some of it is consumed by the routing process. Operating System (OS): Your device’s operating system runs a few background services that is used to establish and maintain the connection related activities. These OS level services consume some bandwidth to run their operations. However, the amount of bandwidth consumed by these services vary from OS to OS. Disk Read/Write Speed: This is not usually a crucial factor unless you’re on a very high speed internet connection or using a hard drive with very low R/W speed. But if your device is not able to write the data to the disk fast enough, a faster connection won’t be useful. In other words, the connection speed should be less than you disk speed. A lot of file hosting websites and services (for ex. RapidShare) offer file downloads at two different schemes. A free regular download, where your download speed, bandwidth, number of parallel connection, auto resume capability, etc. are limited, and some paid Premium plans which remove these limitations. The same server may be capable of handling both types of requests. Here, the server controls the speed and bandwidth for individual connections. If the connections are from paid users, speed / bandwidth caps are lifted and they get to utilize full server resources. Other users, however, only get to use a small portion of these resources for a limited amount of time. Sometimes, parallel connections from the same IP is also restricted. In that case, even your download manager won’t be able to download any faster than your regular speed. Premium plans in these kind of file hosting services allow you to utilize their full bandwidth. However, it does not mean that you will get more speed and bandwidth than your local ISP can provide. So, even though a particular server allows you to download, say at 2000 KBps; on a 2Mbps connection, you can only utilize up to 256 KBps. Regular downloaders that are integrated with web browsers download files through a single connection. To enhance downloading speeds, third party download manager applications (For example; IDM, DAP, Orbit Downloader, etc.) are available which are able to set up multiple connections in parallel to download a file. Of course, this feature can be primarily controlled by server restrictions. However, if allowed, download managers can simultaneously download several parts of the file and hence improve the overall downloading speed. Torrent downloads work in a different way than regular downloads. Instead of the conventional client-server model, this technology is based on a peer-to-peer model (P2P). In this model, data can flow universally among number of connected users, known as peers. A file being shared on P2P is distributed across the entire network. There are two types of Peer – Seeder and Leecher. Seeders are users uploading data in the network, and leechers are those who are downloading it. In a torrent network, if there are more number of leechers than seeders, downloading speed might decrease as there are more nodes downloading the data than those who are uploading. On the other hand, if there are more number of seeders, downloading speed might be higher. Torrent downloads can, in fact, be faster than regular downloads, since there are numerous active parallel connections to download parts of the data. Nodes can connect to a torrent network via BitTorrent clients. Once peers complete download, they can also seed it for other leechers to download from. You can find out your own connection speed by performing an online test. Speedtest.net is a good web application to rate your connection in terms of Download and Upload speed. Conclusion: Connection speed and download speed are fairly the same thing, only measured in different units. So, to get download speed (in KBps) from connection speed (in Mbps), first multiply the connection speed by 1024 to convert from Megabit (Mb) to Kilobit (Kb), and then divide by 8 to convert it from Kilobit (Kb) to Kilobyte (KB).